Project obstacles and solutions: The Indiana Department of Transportation put out bids on replacing the bridge deck on Highway 150 in Orange County. They wanted to use an internal cure, high performance concrete (IC-HPC) to test its lifecycle impact against concrete on other bridges. IC-HPC is a new concept that uses hydrated, lightweight fine aggregates in the concrete mix along with ultra-fine supplementary cementitious material (SCM) in place of Portland cement. The result is a concrete that is very strong due to the internal hydration of the cementitious materials over a long period of time. It also cracks less than normal concrete. This is the critical piece that INDOT is looking at when using IC-HPC in bridge deck replacement throughout the state. Another factor for using SCMs in the IC-HPC mix is their resistance to de-icing salt damage. The use of SCMs and haydite aggregates in building materials are recognized as green building practices throughout the industry. This also made the use of a IC-HPC mix all the more attractive to INDOT. INDOT partnered with Purdue University through the Joint Transportation Research Program to help design the engineering specs and test the long-range impact of IC-HPC. IMI put the QC/QA department to work on a mix design that would meet the parameters of the engineering specifications. IMI tested the hydration of haydite sand after it had been immersed in water. This was critical to the internal hydration and strength gain of the concrete. Special attention was given to the rest of the raw materials in proportion to the hydrated haydite sand. IMI tested mixes for 1-1/2 months in order to come up with a mix design that would meet the long-term goals of the project. The approved batch was a mix of the wet haydite sand - soaked and drained 60 hours prior to batching - natural sand, two pozzolan SCMs (silica fume and slag), coarse aggregates, Portland cement, and other ad mixtures. Meeting engineering specs are one aspect of this job. Maintaining concrete plasticity during the entire length of the pour so it can be placed with ease is another consideration. QC/QA had to keep this in mind when designing this concrete mix. Ragle, Inc. was awarded the Highway 150 bridge project. Traffic was diverted to one side of the bridge while construction took place on the opposite lane. With any limited access highway project, there are schedules and deadlines to be maintained. Keeping the concrete freshly batched and delivered continuously during the pour was paramount to the success of the project. 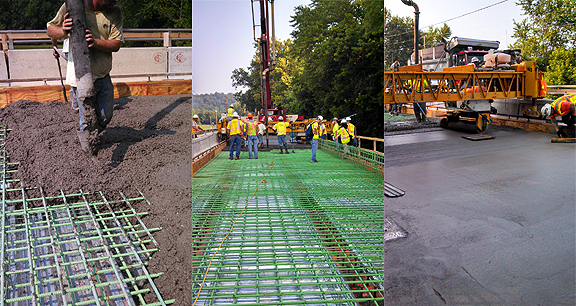 IMI supplied a total of 143 yards of the IC-HPC in less than four hours to complete one lane of the bridge deck. IMI QC/QA worked with Purdue University to test the concrete as each mixer truck rolled onto the job site. The concrete was pumped onto the bridge without any clogging or slowing the flow. Ragle was able to finish the deck ahead of schedule without any downtime. For more information on SCMs and green building materials produced at IMI, click here.